TURNERS FALLS, MA — Three years ago, Kurt Richardson, an instructor in Franklin County Technical School’s Landscaping and Horticulture program, and Nancy Hazard, a member of the Greenfield Tree Committee, hatched an idea for how the Tech School could create a tree nursery for their students, providing shade trees for Greenfield and other towns at a reduced cost. The idea came to fruition last year when David Detmold, chairman of the Montague Tree Advisory Committee, joined the effort and Richardson brought the school on board. The Tech School and the Greenfield and Montague tree committees wrote a grant proposal for the project, which resulted in an $18,000, five-year grant from the Community Foundation of Western Massachusetts to create a tree nursery on the grounds of the school. Richardson said the plan is to plant 75 trees per year over the next five years. After five years, the students can harvest and sell trees from year one and use the money to buy more trees. At that time, the tree nursery is expected to become fully financially self-sufficient. “Projects like this really fulfill our mission to provide services to the communities that support us,” Richardson said. In Greenfield and Montague, there is a significant need to plant trees, according to project organizers. Many older trees in both towns are in decline and are being cut down. In recent years, more trees have been removed than planted, according to the tree committees. 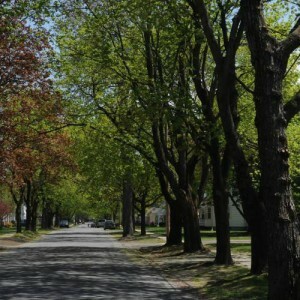 Additionally, the 2014 Greenfield Tree Inventory found that more than half of the street trees inventoried are aging Norway maples that are likely to die over the next 10 years. The Greenfield Tree Committee hopes to replace these nonnative trees with native trees and cultivars that support the local ecosystem.